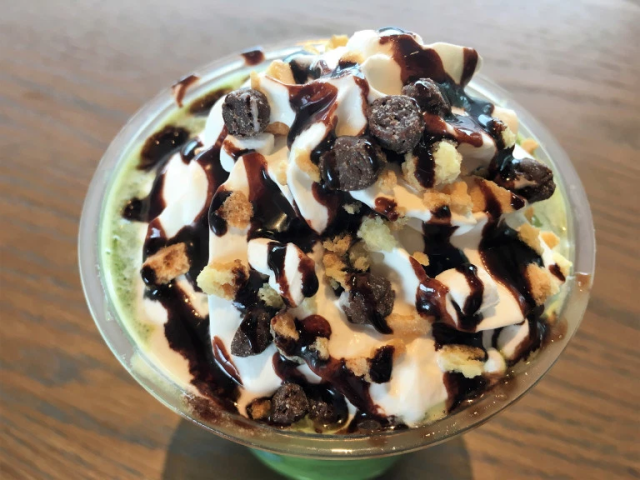 While the matcha Frappuccino sits on the throne of Starbucks Japan’s blended ice beverage monarchy, a permanent menu item it’s often overshadowed by flashy limited-time flavors. But as of this week, the flashy new flavor itself is a green tea variant, in the form of the Matcha S’more Frappuccino. 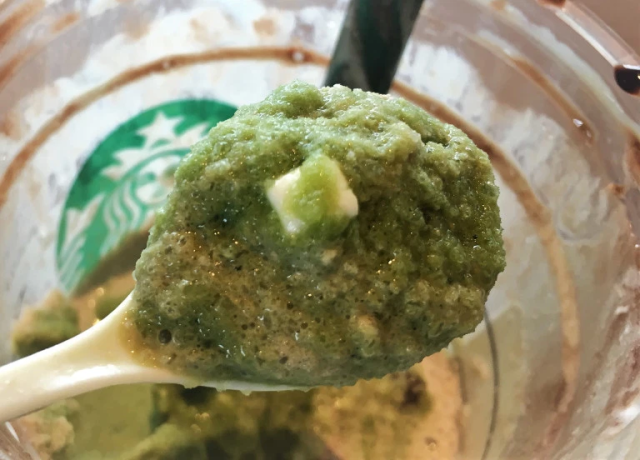 Now you might expect the Matcha S’more Frappuccino to simply be a regular green tea Frappuccino with some extra toppings, but that’s not the case. When the barista handed us our drink, we noticed it was a much deeper shade of green than we’re used to. That’s because the Matcha S’more Frappuccino uses 50 percent more green tea powder than the standard green tea Frappuccino, and to let it really make its presence felt, the new drink is made with non-fat milk, shifting the dairy to a less-obtrusive supporting role in stimulating your taste buds. Moving on to the s’mores part of the equation, bits of delightfully squishy marshmallow and soft, gooey graham cracker are mixed into the icy matcha base. On top, there’s the customary Frappuccino swirl of whipped cream, drizzled with chocolate sauce and sprinkled with chocolate chunks, bringing back memories of melty chocolate dripping out of s’mores being roasted over a campfire. With their palate-pleasing powers combined, the Matcha S’more Frappuccino satisfies both bitter and sweet cravings, and thanks to the low-fat milk, never feels greasy or cloying. It’s also worth pointing out that as popular that while s’mores are essential camping supplies in the U.S., they’re far less common in Japan, making the Matcha S’more Frappuccino a second-tier example of Starbucks’ dessert beverages combining American and Japanese flavors to create hybrid hyper-delicious treats. The Matcha S’more Frappuccino is priced at 590 yen for a tall, and will be available until August 30. Sugar water by any other name is still sugar water. Just had one....not that impressed . I actually like the regular Matcha frapuccino better. The marshmallow and cracker topping is a mismatch with green tea flavor imo. but 3ach to their own. The beverage looks as jumbled up as this sentence.